So this is what the Republican party has become in 2013, and this sorry, mavericky RINO was nominated the GOP’s presidential candidate in 2008, ever wonder why you lost? RINO John McCain (R-AZ) called out Republicans who would dare oppose a bad budget deal that does nothing to reduce the out of control spending and the +$17 trillion debt. McCain said that Republicans who vote against the budget deal lack “intellectual integrity”. Really sir, you may want to look up that definition as you are exactly what is wrong with the GOP and the lack of any integrity to stand for the American people, the catastrophic escalating debt and our hero soldiers. So this is about some gutless GOP Senators worried about a government shutdown, rather than the collapse of the USA with unsustainable spending? A bunch of establishment RINO’s are more concerned on how a shut down will effect them, rather than being statesmen and doing the right thing for the American people? UNREAL … sadly we have become a government of, by and for the American People establishment government class. Spending is increased; however, the budget comes at the expense of our heroes, injured veterans who have given of their body and mind to the defense of this nation to have their benefits reduced. ARE YOU KIDDING ME!!! Civilian workers do not face the same benefit cuts, it is on the backs of our wounded warriors. You should all be ashamed of yourself. So this is what bi-partisanship looks like, agreeing on crap? And a note to the GOP … I am sick of your excuse that you only control the House, these gutless RINO’s would have done the same if they controlled the Senate. Senate Democrats actually block an amendment to restore veteran benefits by closing illegal immigrant welfare loophole and still these treasonous 12 Republican Senators voted for this rotten bill. So illegal immigrants were just treated better than the men and women who have givens arms, legs, mind body and soul to defend America. That my GOP turncoats would be the definition of a lack of “Intellectual Integrity”. As stated at The Right Wing News, we all know that the Dems prefer illegals to our military vets, but my issue is with the GOP traitors. I expect this kind of crap from the LEFT, I do not expect it from Republicans. And we wonder why establishment Republicans are being primary challenged. RONALD REGAN WOULD DISAGREE WITH MC RINO. For all of those who have said that Reagan would not agree with the Tea Party, you have no clue. Reagan left the Democrat party, stating, I did not leave the Democrat party, the party left me. Sadly, the Dutch would probably say the same thing today and leave the GOP. I want you to listen to what Ronald Reagan said during a 1975 interview with Johnny Carson on ‘The Tonight Show” and his brilliance of what he spoke of then, that is even more applicable today. Reagan had it right, government was not the solution, it was the problem. The US, its people, business and the economy would work gang-busters if the government got out of the way. The VIDEO below is a must watch. Remember when Ronald Reagan responded to Johnny Carson in 1975 on how do you balance the budget? Reagan said, “balance the budget is like protecting your virtue, you just have to learn to say no.” I guess we now know where Nancy Reagan got her idea against drugs to “Just Say No”. So as the MSM is telling you who are the “winners” and “losers” of the government shutdown ending, add Senate Minority Leader Mitch McConnell (R-KY) to the list of greedy winners. Why you ask? 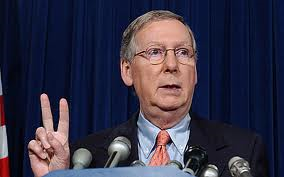 As reported at WFPL News, the deal between Harry Reid (D-NV) and Mitch McConnell (R-KY) included a $2 billion, oops sorry … $3 billion earmark for a Kentucky damn dam project. And you wonder why McConnell pushed this bill in the Senate? So we have a federal debt about to go over $17 trillion, the debt limit has just been raised, government spending is continuing to be out of control and unsustainable and we have establishment Republicans like Mitch McConnell getting theirs and making matters worse. Yet some how it is fiscal minded Conservatives like Sens.Ted Cruz (R-TX)Rand Paul, Rand Paul (R-KY) and Mike Lee (R-UT) who are called crazy, dangerous extremists. God help this country. However, as the Lonely Conservative correctly states, the real “losers” in this are the American People! This is exactly the reason why “establishment” Republicans who have forgotten what it means to be a Republican need to be primary challenged. Did Mitch McConnell not learn from what happened to Senator Ben Nelson (D-NE) and the Corn Husker Kickback? Speaker Boehner and GOP cave … In a country that already spends more than it takes it, irresponsible politicians kick the can down the road and raise the debt limit to spend even more money that America does not have. Tonight the US Senate and House of Representatives passes the Senate led bill to end the partial government shutdown and increase the debt limit. The Senate passed the bill 81 to 18 and the House voted in favor of it 285 to 144. Incredibly, not one Democrat in the House or Senate voted against raising the debt on “We the People”. Imagine that? CNN reports that President Barack Obama will sign it immediately. The director of the Office of Management and Budget said that federal workers should expect to return to work Thursday morning. Hmm, does this mean that open air monuments will be open to of military veteran heroes? In Obama’s speech tonight there was no reference to the GOP as terrorists or hostage takers … where is the evil rhetoric Mr. President? With the Treasury Department warning that it could run out of money to pay national obligations within a day, the Senate voted overwhelmingly Wednesday evening, 81 to 18, to approve a proposal hammered out by the chamber’s Republican and Democratic leaders after the House on Tuesday was unable to move forward with any resolution. The House followed suit a few hours later, voting 285 to 144 to approve the Senate plan, which would fund the government through Jan. 15 and raise the debt limit through Feb. 7. From Business Insiders, Here’s The Bill That’s Going To End The Government Shutdown And Raise The Debt Ceiling. A list of the 18 Republican Senators who voted against the Bill that will raise the debt and continue the out of control, drunken spending of politicians. UPDATE I: All the House, Senate and President have done is kick the can down the road and solve nothing. No one wants to make the tough and responsible decisions because we have politicians who care more about their power and their agenda than they do “We the People” or the United States of America. Honestly, who in their right mind thinks that a country can continue to borrow billions of dollars a day and actually sustain itself? Closed for the first time in 17 years, Congress misses the deadline as the federal government shuts down of non-essential personnel. The House sent over one last bill to the Senate late last night to which Democrat Senate Majority leader and the Democrat controlled Senate voted it down 54-46. As reported at The Hill, the measure would have delayed the individual mandate, a core piece of the Affordable Care Act, and prevented congressional lawmakers and staff from receiving federal subsidies when they enter healthcare exchanges. Nice, so the Senate wants their preferential treatment of subsidies as the People eat cake. Surprisingly, the GOP did not cave as Harry Reid had previously said there would be no negotiations. 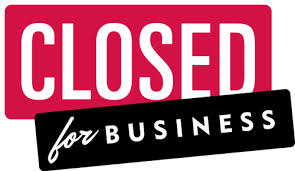 Congress adjourned early Tuesday morning without renewing funding for the federal government and the White House issued orders beginning the grim task of shutting down “nonessential” services across the nation. Senators gave up first, adjourning soon after midnight, while House lawmakers stuck it out past 1 a.m. But with a middle ground proving elusive and senators refusing to negotiate over changes to the health law, the House too gave up and vowed to try again later in the day. With no prospect of a deal to continue funding into fiscal year 2014, the White House budget office issued an order just before midnight to begin closing operations, sending 800,000 federal workers on furlough and leaving hundreds of thousands more employees required to report for work though without the guarantee of paychecks. One program that didn’t shut down was the program at the center of all the GOP ire — Obamacare itself. The president’s health care overhaul is funded through other laws and, despite the shutdown, is up and running as of Tuesday morning. Americans without health insurance can now go on state-based exchanges to begin shopping for insurance, often with the benefit of government aid. The debate raged even as Congress careened through the deadline, with House Republicans sending repeated proposals over to Senate Democrats, though never the one plan senators demanded: a funding bill with no strings attached. The real question is … will most people even realize that the government is shut down? What is not shut down. The end result of all of this is that the federal government has failed “We the People” … whether they be LEFT or RIGHT, the establishment government of both parties have woefully failed the people.